Updated 3/2017 -- photos/videos and all links removed (except to my own posts) as many no longer active. Afternoon Nap Society is the host for this week’s Grand Rounds. You can read this week’s edition here. ………….This week, Grand Rounds is mine, and in selecting blog posts, I evaluated submissions based on their topicality, writing style, and personal appeal. What I look for in a blog as an ePatient may differ from what a physician or even another ePatient looks for; however, the goal of Grand Rounds is to foster dialogue, and more and more we are learning that in order for a healthcare dialogue to be truly effective, it must include the patient perspective. As a result, Sean Ahrens, an ePatient and software designer who is building Chronology, an online network on which patients with Crohn's and Colitis may connect and learn from one another, opens this week's session….…. In the outpatient setting, between 8% and 26% of abnormal test results, including those suspicious for malignancy, are not followed up in a timely manner. Despite the use of electronic health records (EHRs) to facilitate communication of test results, follow-up remains a significant safety challenge. In an effort to mitigate delays, some systems have adopted a time-delayed direct notification of test results to patients (ie, releasing them after 3 to 7 days to allow physicians to review them). On September 14, 2011, the Department of Health and Human Services jointly with the Centers for Medicare & Medicaid Services, the Centers for Disease Control and Prevention, and the Office for Civil Rights proposed a rule allowing patients to access test results directly from the laboratory by request (paper or electronic). .………. …….."I've had people tell me I'm beautiful," Nash said in the interview that aired Monday. "And they were not telling me I was beautiful before." Nash said she was cheered by a simple "hello" from a child while she was shopping recently. Scientists at Weill Cornell Medical College used genetic methods to successfully repair cleft lips in mice embryos specially engineered for the study of cleft lip and cleft palate. The research breakthrough may show the way to prevent or treat the conditions in humans. ...……. Q. Is it really necessary to prevent patients from drinking water for many hours before surgery? A. The well-known rule that a preoperative patient should have “nothing by mouth after midnight” was not based on scientific evidence, and many medical organizations now have more flexible guidelines. For example, American Society of Anesthesiologists guidelines generally permit clear liquids until two hours before surgery. .……. Be sure you ask your surgeon and anesthesiologist what the rule is for you as the above is for healthy individuals. It may vary depending on your set of health problems and the surgery you are scheduled to have. I love watching my dog shake water off. 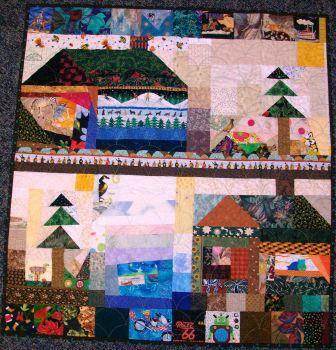 The Alliance for American Quilts received 119 quilts for it’s 2011 "Alliances: People, Patterns, Passion" contest. You can see all the quilts here. My entry was “Redwork Quilt” and is included in this week’s (Week Two --Mon, Nov. 21- Mon, Nov. 28) quilts being auctioned off on eBay. were performed in 2009. For insurance coverage in the United States a woman seeking breast reduction must have complaints of physical symptoms (ie neck pain, upper back pain, inframammary rashes, etc). diminished self-esteem, poor psychosexual function, depression, and anxiety. I want to applaud them for their article. There are 52 article in their reference list. Table I is a breakdown of 6 articles on physical symptoms/improvements. Table II is a reference does the same for 8 articles on the effects of reduction mammoplasty on exercise, weight and eating behaviors. Table III does the same for 5 articles on the effects of reduction mammoplasty on psyche. Table IV summarizes 3 articles on the effects of reduction mammoplasty on appearance. Women who undergo RM have a functional improvement in musculoskeletal pain, headaches, sleep, and breathing. Psychological benefits are vast and include improved self esteem, sexual function, and quality of life, as well as less anxiety and depression. Following RM, women appear to exercise more and have a reduction in eating disorders. This is what I saw over my 21 years of practice in taking care of these women. 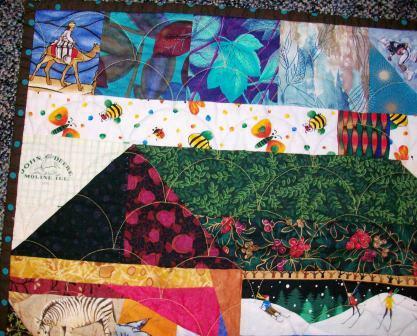 I am finally getting around to posting about the quilt I received as part of ALQS6. I received it in the mail nearly a month ago. It is lovely! 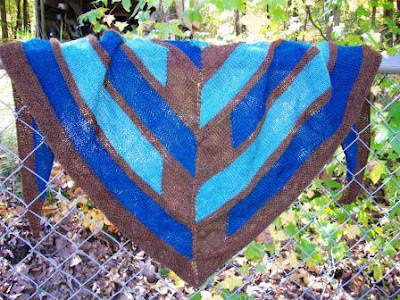 It was made by Jay who blogs at Creative Crone from studio Q. 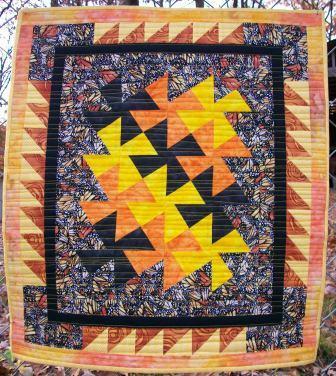 She named the quilt Monarchs. Jay sent me extra fabric so that I can sew a sleeve on the back and hang it. The photos don’t do it justice. Here is a link to the quilt (Mariner’s Compass Rose) I made for ALQS6. It was mailed to Veronique in Chile. Here are the posts of the quilts made and received from the first five ALQS. As I have in the past few years at Thanksgiving, I am again joining in the Engage with Grace (#EWG) blog rally. It is a time when families get together. Please, use this time to discuss end-of-life issues with your family. Here's a summary prepared by Alexandra Drane and others involved in this issue. Once again, this Thanksgiving we are grateful to all the people who keep this mission alive day after day: to ensure that each and every one of us understands, communicates, and has honored their end of life wishes. Updated 3/2017 -- photos and all links removed (except to my own posts) as many no longer active. Amy Tenderich, Diabetes Mine blog, is the host for this week’s Grand Rounds. You can read this week’s edition here. Welcome to Grand Rounds, Vol. 8, No. 9, the 2011 Thanksgiving edition of the weekly summary of the best health and medical blog posts on the web. Many thanks to the organizers at Get Better Health for inviting us to host! In a world where major economies are imploding and a climate catastrophe seems impending, there is still much to be thankful for — especially in the arena of health and medicine, where technology is empowering a revolution of sorts in hospitals, clinics and doctors’ offices, and in patients’ everyday lives. Last week’s host, Alvaro Fernandez at Sharp Brains, is thankful that everyone contributing to and reading Grand Rounds has a human brain (no bots, we hope! ), and thankful that the human brain is not fully pre-wired. .…. The holidays offer wonderful opportunities to create learning experiences for children that center around cooking. These experiences are especially powerful because they involve all of the senses: smelling, tasting, touching, hearing, and seeing -- which is one reason that memories created in the kitchen can last a lifetime! With a little thought and preparation, you can use this time to build important understandings and skills in literacy, mathematics, science, health, and even art. ………. See how the percentage of residents ages 18 to 64 receiving disability benefits has changed in each state since 2001. …….a parody of Dr Seuss' classic Oh, the Places You'll Go! It is a candid look at the journey people make in order to become doctors. I found it charming. Go download it. .……. A short note on Cutting for Stone, a novel I’ve just read by Dr. Abraham Verghese. He’s an expert clin­ician and pro­fessor at Stanford. The author uses rich lan­guage to detail aspects of Ethiopian history, med­icine and quirks of human nature. The book’s a bit long but a page-​​turner, like some lives, taking a strange and some­times unex­pected course. For today I thought I’d mention one passage that haunts me. …….……. 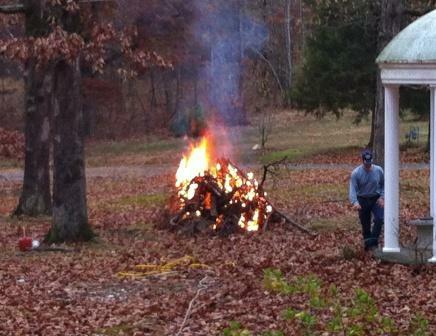 A month ago during a storm with significant straight line winds we had a tree near the house loss it's top half. Upon inspection, it turned out the pine tree was infested with pine beetles. 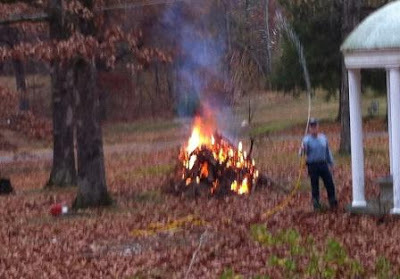 We were encouraged to burn the debris to help protect the other trees from the beetles. Medscape has a really nice article with video by Kenneth L. Silverstein, MD; Stephanie Josephon -- Surgical Fires: How They Start and How to Prevent Them. ……….For those of you watching, you can find out more about the FDA's Preventing Surgical Fires Initiative on our Website. You can also download educational materials and other resources to help reduce the risk for fire at your facility. We hope you'll join our partnership to help eliminate surgical fires. Thank you for watching. As with my husband’s fire, thought must be given to the surroundings, what in the area is flammable or the fuel (in the OR – surgical drapes, patient, etc), accelerants or oxidizers (in the OR – concentrated O2, etc), and igniters (in the OR – lasers, cautery). There must be forethought to prevention, but there must also be thought given to what do we do if a fire starts. Where is the fire extinguishers? Does the staff know what to do? 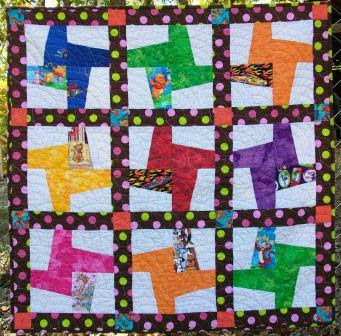 This baby quilt is another one using scrapes. I tried to make it appear as if there were two houses with trees. The quilt is 35 in X 37.5 in. It is machine pieced and quilted. There are many interesting thing to find: a peasant, a squirrel, a butterfly, carolers. Here you can see a wise man on a camel, a football player, bees, skiers, a zebra. Here you can find a hippo, a dog on a motorcycle, a robot. 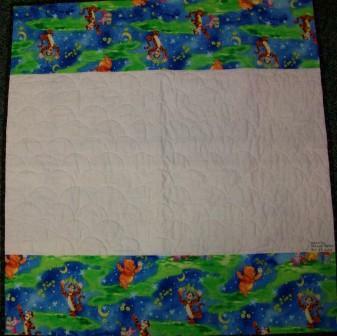 The back is pieced using leftover Winnie the Pooh fabric and white muslin. Sharp Brains is the host for this week’s Grand Rounds. You can read this week’s myth buster’s edition here. Wel­come to a new edi­tion of Grand Rounds blog car­ni­val, the weekly edi­tion of what’s best in the health and med­ical blo­gos­phere. This week, twenty four blog­gers share data, insights, ques­tions, reflec­tions and more. Enjoy! Dr. Robert Oren­stein at ACP Hos­pi­tal­ist: thor­oughly clean­ing patient’s rooms can dra­mat­i­cally reduce healthcare-acquired infec­tions (HAI). …. On Nov. 19, 2001, Susan Ainbinder Hutchins received a call saying that her son, Kevin Colbert, who worked at an investment bank on the 89th floor of 2 World Trade Center, had been identified among the ground zero remains. But the nightmare was not over. “The calls kept coming and coming and coming,” she said. For several years, at roughly two-month intervals, she was informed that another piece of her son had been identified. “Nobody gets it,” she said. “They don’t understand why I’m stuck in such an awful place.” ………. Designed to improve patient understanding of medical problems, drawMD utilizes the iPad's unique interface to allow anyone to sketch, stamp, or type directly on detailed anatomic images. The included images are tailored to each specialty and provide the ability for doctors to communicate and explain treatment plans, including surgical procedures, as well as document these plans for patient records. I’ve been following the recent Delta airlines flu vaccine kerfuffle with interest and now amazement. After running in-flight infomercials by a notorious anti-vaccine group (NVIC), the American Academy of Pediatrics alerted Delta to the faux pas with a letter from president Robert W. Block, M.D. I had assumed that Delta would be grateful for the head’s up, and would immediately remove the infomercials. Instead, they chose to ignore the letter, denying that they saw any harm in associating themselves with anti-vaccine activists. Despite the warning, they will continue to run the ads through the month of November….. Which means that I will NOT be flying Delta in the foreseeable future and I hope you won’t either. When US physician organizations are flat out ignored by corporate executives, it leaves us with only one choice – to speak with our feet. Sadly, the bottom line may matter more to them than the health and safety of their passengers. You may sign a petition against Delta’s actions here. Or use the #DontFlyDelta hashtag on Twitter. ……. It's funny how a few words, a phrase, or music can bring back buried memories. I heard this song on the radio this morning. A rush of memories flooded my brain in the form of the smiling face of a beautiful little girl. ……. 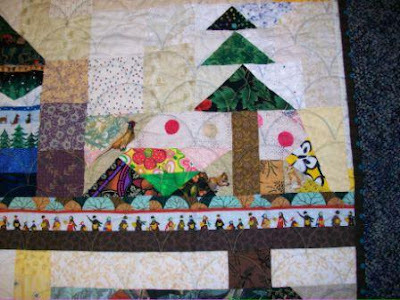 The Alliance for American Quilts received 119 quilts for it’s 2011 "Alliances: People, Patterns, Passion" contest. You can see all the quilts here. 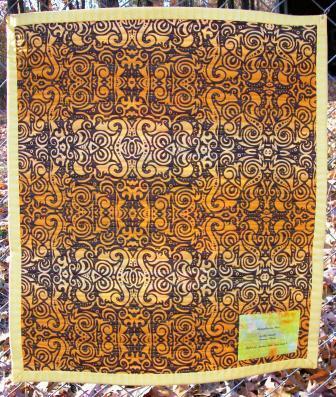 My entry was “Redwork Quilt” and is included in Week Two (Mon, Nov. 21- Mon, Nov. 28) quilts being auctioned off. All medical offices must dispose of medical waste in a safe manner. I closed my office at the end of September, but my last medical waste pickup is the first Friday of December. My dear husband is going to open the office and wait for them. How have you told patients over the years to deal with their medical waste? Needles? Syringes? JP drains they pull out or that fall out before they get back for follow up? Last week the FDA sent out a press release announcing the launch a new website for patients and caregivers on the safe disposal of needles and other so-called “sharps” that are used at home, at work and while traveling. …….Sharps disposal guidelines and programs vary by jurisdiction. For example, in 2008, California passed legislation banning throwing needles in household trash. Florida, New Jersey and New York have established community drop off programs at hospitals and other health care facilities. People using sharps at home or work or while traveling should check with their local trash removal services or health department to find out about disposal methods available in their area. If an FDA-cleared container is not available, some associations and community guidelines recommend using a heavy-duty plastic household container as an alternative. The container should be leak-resistant, remain upright during use and have a tight fitting, puncture-resistant lid, such as a plastic laundry detergent container. Keep sharps and sharps disposal containers out of reach of children and pets. Call your local trash or public health department in your phone book to find out about sharps disposal programs in your area. Follow your community guidelines for getting rid of your sharps disposal container. Throw loose sharps into the trash. Flush sharps down the toilet. Put sharps in a recycling bin; they are not recyclable. Try to remove, bend, break or recap sharps used by another person. Attempt to remove a needle without a needle clipper device. These three items were completed over the summer months. The first one is a small shawl that I knitted as part of my first KAL (knit along). I used three shades of Berroco Ultra Alpaca Fine yarn. I plan on giving it as a gift to my stepmother-in-law for her upcoming birthday. 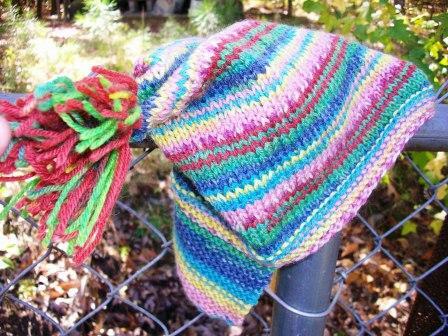 I used some of the leftover yarn from the above shawl to knit this child-size hat. 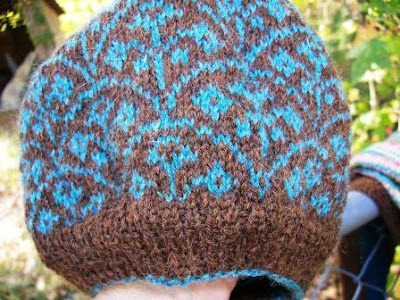 It uses the pattern Selbu Modern by Kate Gagnon Osborn. It will go to one of my nieces or great-nieces. 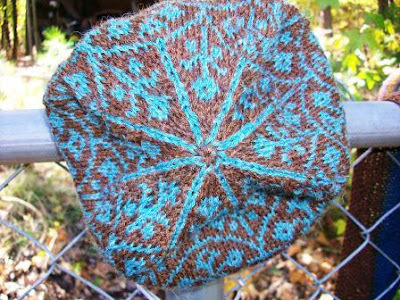 Same hat, but top view. This Jester Hat by Bernat Design Studio, also child-size, was made using left over Patons Kroy Socks Jacquards yarn. Better Health is the host for this week’s Grand Rounds. You can read this week’s myth buster’s edition here. As regular readers of the Better Health blog already know, I am opposed to health misinformation. In fact, I started this very blog because of my disappointment with the sheer volume of false claims, misleading stories, and pseudoscience actively promoted to patients. It was my hope that gathering together key medical blogger “voices of reason” would promote health sanity on Google. You could argue that we’re tilting at windmills, but tilt we must – and I’m proud to say that our membership now includes contributions from the CDC, the American College of Physicians, Harvard Health publications, Diario Medico (Spain’s premier MD website) and over 100 independent bloggers who are standing with us in an attempt to provide smart health commentary to patients and providers alike. And with that, let us begin our terrific Grand Rounds tradition (now in its eighth year – which in blog years is about 120) of highlighting this week’s best of the medical blogosphere… (And yes, that’s me with Mythbuster’s TV host Adam Savage, circa 2009).…………. as well as certain situations—…………. Organ recipients aren’t supposed to contact the families of donors - those are the rules. Check out Dr. Wes’s post: Smile! You're on Candid Camera! The door opened, there was their loved one, looking no worse for wear, followed by the doctor. As he came forth to tell them the good news, the cellphone video recorder captured the discussion, ….. The doctor was caught completely off-guard. In this case, the news was happy. All went well. But what should happen if the news weren't so good or even devastating? ……. Adapted from the poem "I Could"
He calls to the residents, as if he is a bank teller waiting to accept his next deposit. He walks from room to room with the medical students trailing behind. He enters the cubicle without taking the time to introduce himself. He touches breast tissue with precision and tenderness. Yet to put his arm around the shoulder of a suffering patient would be considered to intimate. ……. 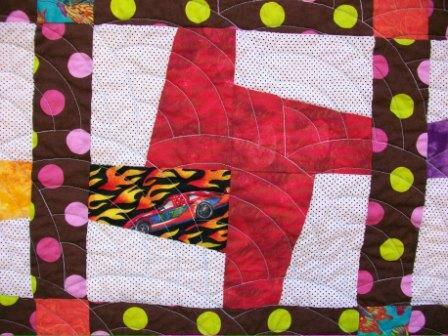 ……….I believe I’ve discovered a quilting genre that appeals to my personal aesthetic. 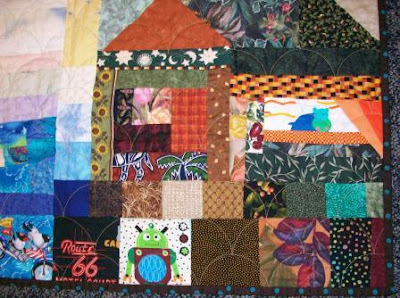 The fast-growing modern quilt movement is inspired by modern art and architecture. This past Friday a twitter/blog friend @jabulani9 notified me that another of our twitter/blog friends @trilisakay had died the day before. I have decided that The Tale of My Left Foot is done. 34 monthes ago, I had my first surgery on my ankle and 1 month later learned I had cancer. I have documented my journey, my triumphs, my failures, my fears and last weekend I completed a triathlon. So, now the "Tale" feels done. Thanks for travelling this road with me. In January of this year she underwent a major surgery with reconstruction (a gracilis flap) when her cancer returned. I answered some questions for her regarding the flap, etc. I tried to encourage her as she recovered and began training again for another triathlon. Truth is, she was encouraging to me as she remained more upbeat than not and pushed forward. I would have loved to have known her in real life. ……I remain as committed as ever to complete my first half marathon just short of the one year anniversary of my surgery. I continue to feel incredibly fortunate to be on this journey with some of the most amazing and inspirational people I’ve ever met. I appreciate everyone’s support more than you know. If you are so inclined you can still donate in her name to her TEAM. 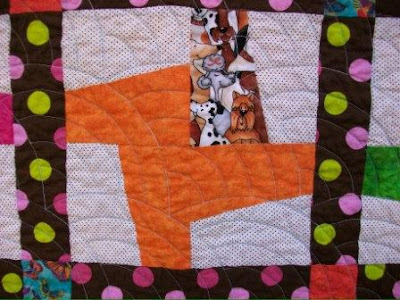 This is the hounds tooth quilt pattern. This is the second time I’ve used this pattern. The first one can be seen here. 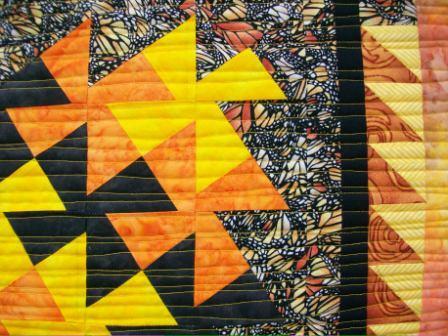 This baby quilt is machine pieced and quilted. Each block has one item of interest (cat, dog, etc). It is 39 in square. I have given it to a sister-in-law who is due in the spring with her third child. 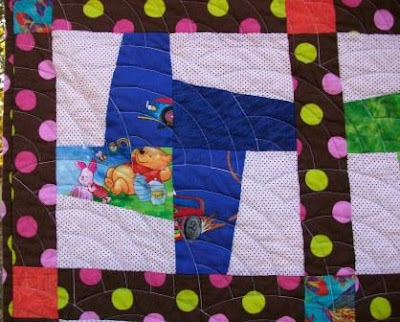 This block features Winnie the Pooh and Piglet. This block features a fast car. David, Health Business Blog, is the host for this week’s Grand Rounds. You can read this week’s edition here. Welcome to the latest edition of the Grand Rounds blog carnival, the weekly roundup of medical blog posts! The Blog That Ate Manhattan kicks us off with the Meaningful Use Song, surely the most antic entry I’ve ever hosted. Can’t beat the zippy refrain “I am the model user of an EMR that’s meaningful.” …………. The oak tree was worn and tired and sat in a field, where it waited to die. i was rotating through orthopaedics and was on call that night. …... once i had finished operating i rushed through the change rooms to get back to casualties. while i was changing i heard the unmistakable sounds of someone throwing up in the toilet cubicle. quite soon the door opened and out came the orthopaedic registrar who was on call that night with me. he did not look good………. "My question for you is, are there times when you wished non-pathologist physicians remembered more about histology? What would you like them to know?" The short answer is this: NOTHING. ………. Mary Lou Ray decided at age 65 that she had seen enough of the person in her mirror. "My life led up to this. I had been divorced for 13 years, my children were grown, and with the death of my mother—not to be unkind—I was finally free of criticism about things like dyeing my hair," she says. So last year she spent $13,000 on a face lift and other cosmetic procedures that proved rejuvenating. "I'm absolutely thrilled," says Ms. Ray, a real-estate agent in Roanoke, Va. "I think a lot of friends in my age bracket would like to try this, but they're afraid of getting that unnatural, yanked-up look. I don't have that; I still look like me." ……..